Greetings, and welcome to Dinosaur Bear! Of course last time we were there it was late summer and we were about 3,212.51 km (1,996.16 mi) to the west of where we were this time. 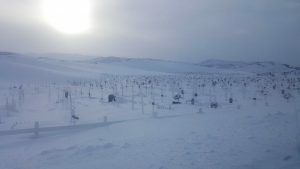 That is not to say that it was warm then by any means, but going to the Arctic Circle in February taught me that the cold I had previously experienced in my life was only the tip of the iceberg – pun most certainly intended! 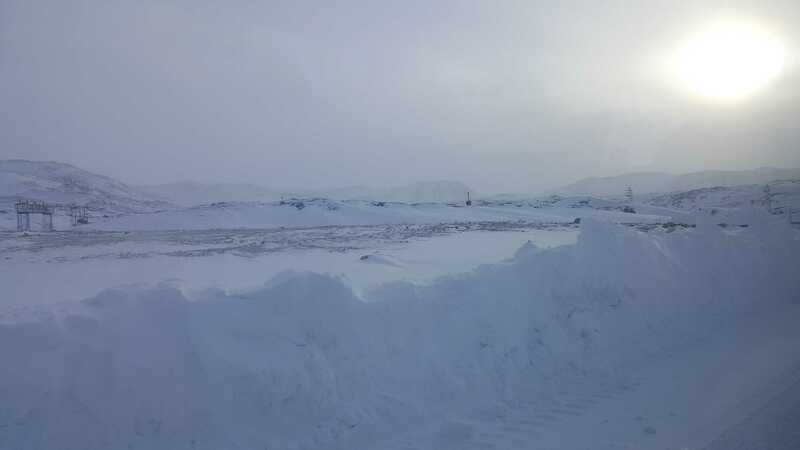 So, where did SB, the Boys, and I cross over into the arctic this time? 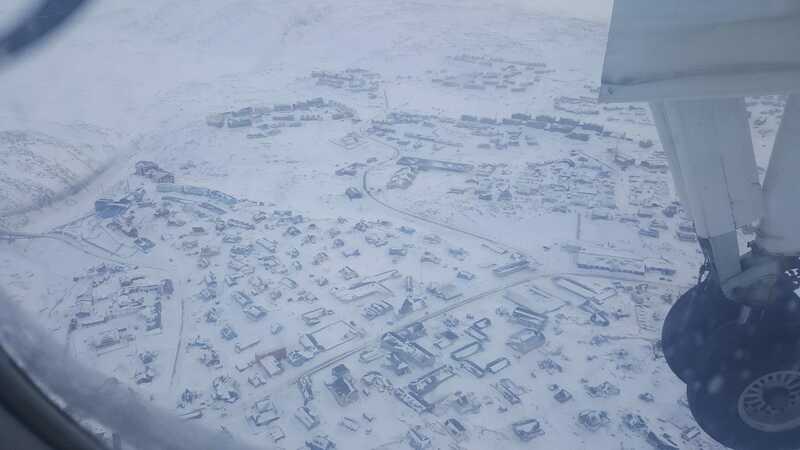 Greenland! 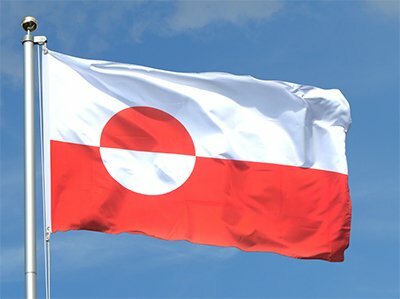 In case it wasn’t obvious, that’s the Greenlandic flag, which I think is pretty neat looking – which I guess is a good segue into a brief bit of history about Greenland itself before I talk about our trip there. Why, you might ask? Because if you’re anything like me you’ve probably accumulated very little knowledge about Greenland over the course of your life. Yes, the ice cap and global warming has come into popular discourse in recent years, but as for the country itself, I didn’t know a whole lot about it until I moved to Iceland. Which I guess makes sense, as growing up in the Midwest doesn’t give you an especially big connection to Greenland. I also feel like its a good idea to know a little bit about a place before I just dive into the pictures, so time for a small (I promise) info session! As a point of reference, here is where Greenland is, Iceland is yellow if you are disoriented by orthographic projections. 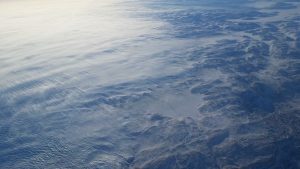 Yes, the oft repeated adage of “Iceland is green, and Greenland is ice” is partially true, but it doesn’t tell the full story. 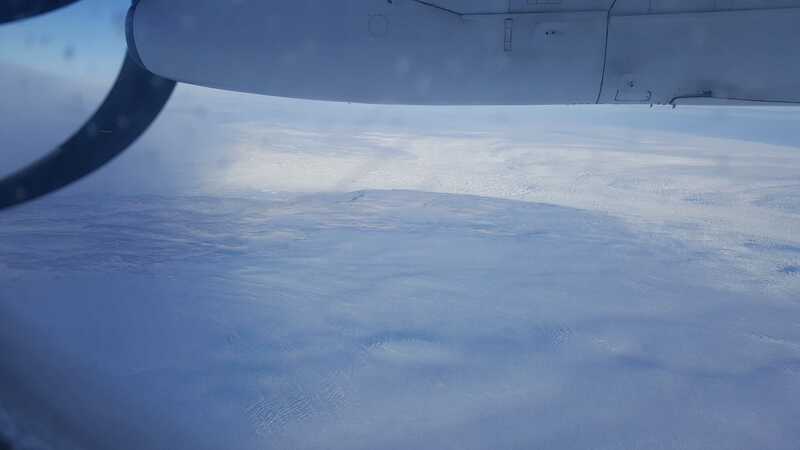 For instance, while Iceland definitely has more green than Greenland, it sure as heck has ice as well. Similarly, parts of Greenland are quite green in the summer. 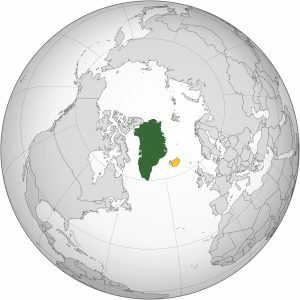 If you’re interested in why Greenland and Iceland got their respective names, click here. 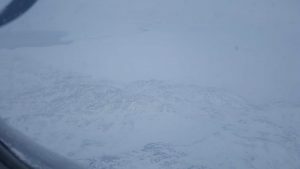 However, etymology aside, Greenland was most CERTAINLY not green when we visited – and oddly enough, Iceland wasn’t icy when we left either (at least not where we live). 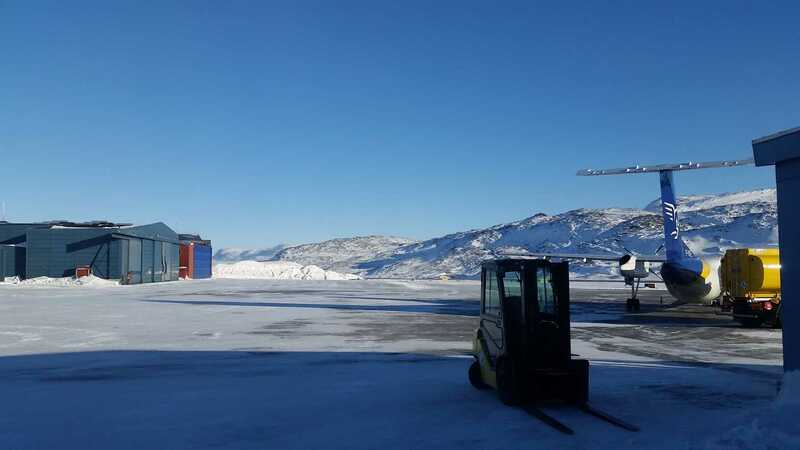 So, ok, Greenland can be sort-of green, part of the year, in some places. But Greenland is much more than the debatable name. For one, it’s very large, coming in at about 2,166,086 sq km (836,330 sq mi) – which makes it the largest non-continental island. However, its population is only about 56,500 – meaning that it is the least densely populated country in the world. Greenland is also an autonomous country, but it’s still a constituent country of the Kingdom of Denmark (just like Iceland was up until 1944) and thus still uses the Danish Kroner as currency. 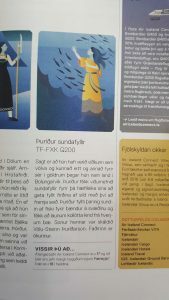 So, the primary languages of Greenland are Greenlandic and Danish, with Greenlandic being more and more emphasized as sort of a “push back” against the colonial language of Danish (in fact since 2009 Greenlandic has been the sole official language of Greenland). I’ve got a little bit of history with Danish and of course there are parallels with Icelandic, but Greenlandic is just HOLY GAWD. That’s a real Greenlandic word (seriously). Oh, and in case you were wondering, “Greenland” in Greenlandic is Kalaallit Nunaat. Anyways, that’s nice general overview of where Greenland is, how big it is, how many people live there, and what the language is like – which I feel like is a good point of orientation for our trip to Greenland. 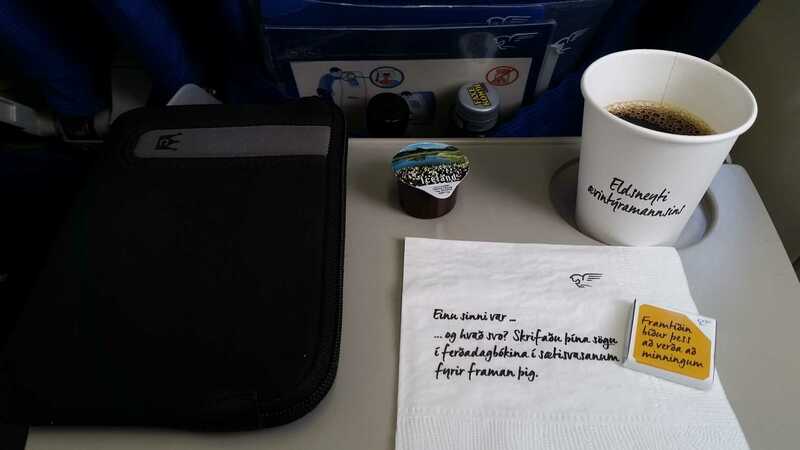 So, why did we decide to go to Greenland when we were already in Iceland? Because we can, of course! We figured we’d likely never be closer to Greenland than we already were, so we started making plans to go almost as soon as we moved to Iceland. The final itinerary changed a few times, but we ended up very excited with what we had planned. 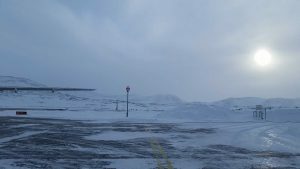 Plus, up until that point it had been a very crummy February in Iceland as far as weather goes, so we figured that maybe Greenland would be different (it was!). That our Greenland trip had fallen on the last week of February was just good timing on our part as far as escaping the “blah” goes! Thing is, it didn’t work out exactly as expected. 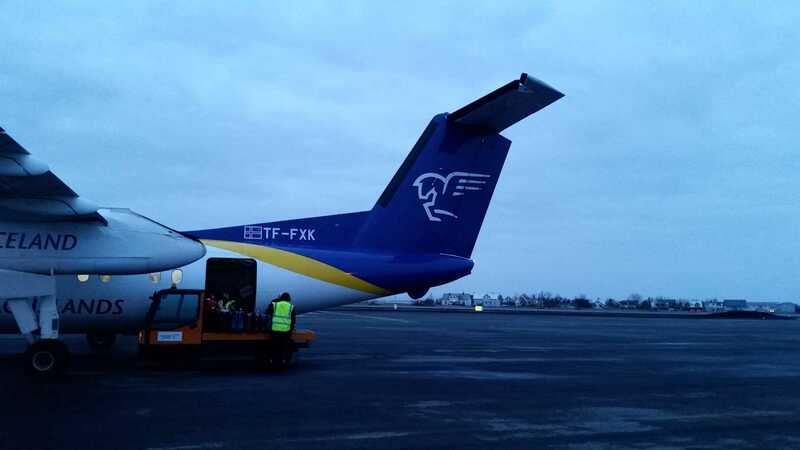 One nice thing about the trip is that since this was a smaller flight (for obvious reasons) we were leaving from the Reykjavík Domestic Airport (Reykjavíkurflugvöllur) rather than the larger Keflavík International Airport (Keflavíkurflugvöllur) which is to the south. As such, rather than having to walk 15 minutes and then get on a bus for 40+ minutes, we only had to walk about 10 minutes – definitely a plus! 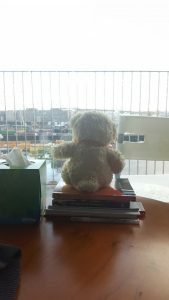 The weather had recently turned from snow to rain – lots of rain – and more gray skies. 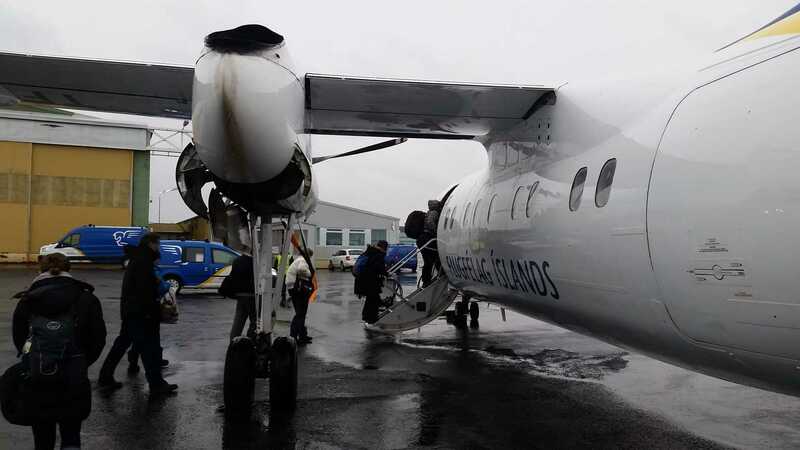 However, rain generally doesn’t effect the domestic airport too much (it’s mostly the wind) so we weren’t too worried about delays on this end. 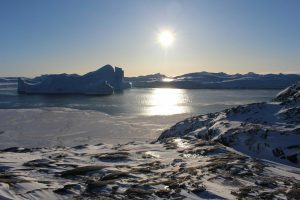 Plus, the place we were bound for in Greenland – Ilulissat – didn’t look to be too bad either (insofar as flight-delaying weather goes). So we made our way to the airport, got our backpacks checked in (not enough overhead room on the smaller Bombadier Dash-200Q we were on) and waited about an hour for the security gate to open. Then we made our way through security and waited some more at the gate. 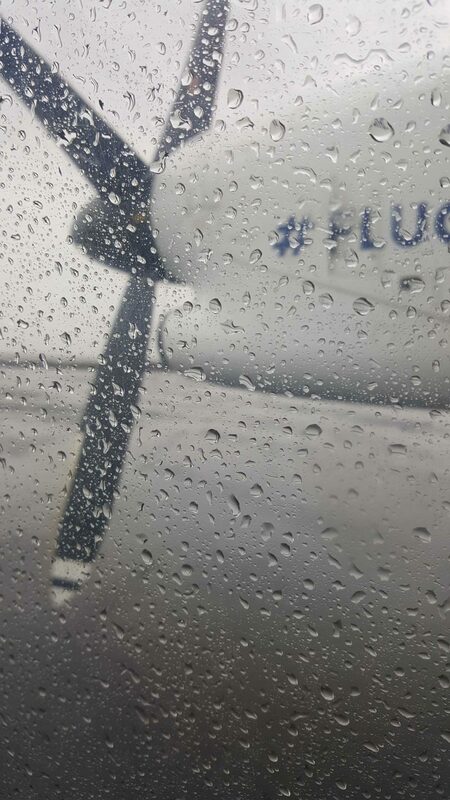 Then, about 15 minutes before we were supposed to depart, they cancelled the flight. Yep, no delay, just straight to cancelled. A snowstorm had moved into the area around Ilulissat and the Ilulissat Airport, which effectively shut down all flights in out for the entire day. That meant that the people who were expecting to come back on our flight got stranded in Greenland – at least we just had to walk 10 minutes back home. 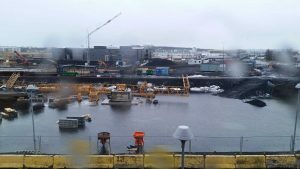 Of course, Iceland being the cruel mistress she is, it had started raining, so we got to walk back from the airport defeated and rained on. Valentino – who had been extremely excited for months about the trip – was quite despondent. As soon as we go back home we started figuring out the logistics of what the cancellation meant. 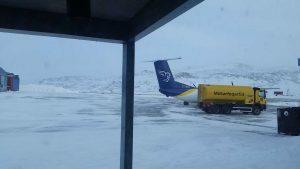 Options were a bit limited because only two flights go to Ilulissat each week. 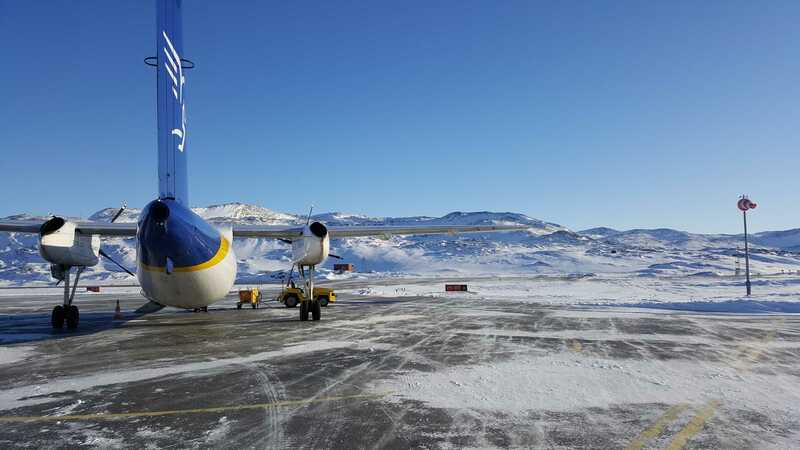 However, Air Iceland doesn’t flat-out remove one of the weekly flights if it gets cancelled, they just reschedule it for the next day, and keep trying that until the flight can get out (sometimes this takes 4+ days). 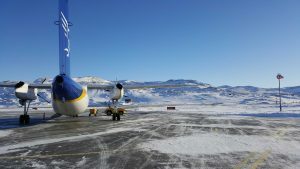 So our flight got rescheduled for the following morning, ,weather permitting. As a result we determined that the best course of action was just to compress our trip down by a day. Not the most ideal thing, but it ended up working out ok. So for the rest of Saturday we just chilled in the apartment and watched Pigsten’s construction site slowly flood from the rain and melting snow (much to Pigsten’s chagrin). The next morning we got up and in an instance of déjà vu proceeded to do everything over again – except this time the flight was slightly earlier and it was raining harder. Oh Iceland. 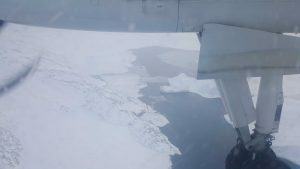 However, the good news is that the weather that really mattered – that is, in Ilulissat – had improved and the flight was on! Once we saw the crew arriving we knew it was a good sign and we didn’t even have to wait as long this time around. Before too long we were out on the tarmac getting rained on and making our way to our plane. The Dash-200Q has a 2×2 seat configuration, which SB and I like – though given how not-full the flight was we probably could have made do with whatever. As we got all settled in the rain picked up outside. That’s “Thurid the sound-filler” in English. Thurid is one of Air Iceland’s five passenger planes and each takes a name from a female figure in Icelandic folklore. Pretty cool. So, with Thurid as our guide we proceeded along on the 3 hour flight which was thankfully pretty docile. 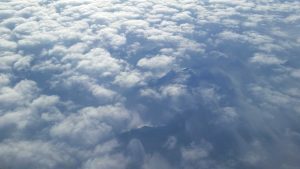 There were only a few moments of turbulence, but considering where we were it wasn’t all that much. In fact the first real interesting moment came when the clouds parted a little bit and we saw what we thought to be the east coast of Greenland. Then, just a short bit later we realized we were over a massive field of snow, which we at first thought was just more clouds. 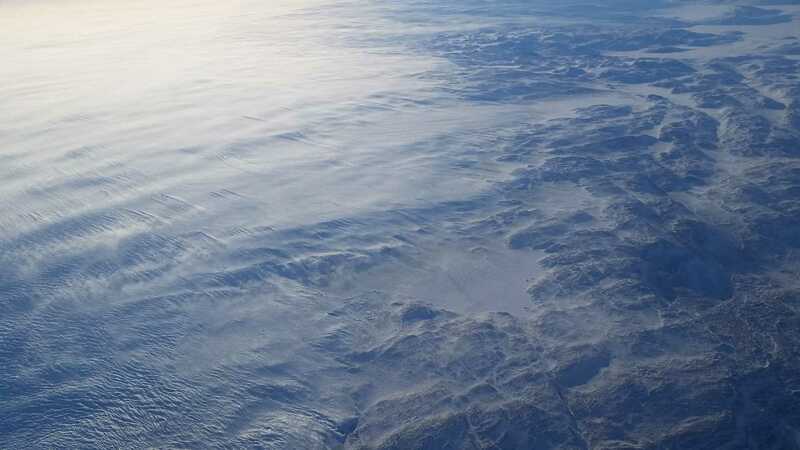 Turns out this was part of the Greenland Ice Cap, which I’ll discuss more later in the post. From there we continued onward across the country until we started to make out some mountains. When we started to see floating ice we knew we had to be getting close to our destination on the west coast! 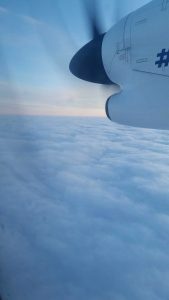 We then realized we were flying up the west coast, meaning that Ilulissat was probably somewhere nearby and when Thurid dropped her wheels we took that as a good sign (or a very bad sign, if you want to be a pessimist). Just a few moments later we were soaring over the small snow-and-ice encrusted town of Ilulissat! 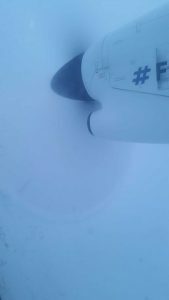 After that we flew over a bit more of the “countryside” and then made what was – all things considered – a quite easy landing on a snowy runway. After getting our stuff gathered we made our way off the plane. Here I just have to say that, you know that cold that is so cold that as soon as it hits you that your reptilian brain immediately begins screaming “WE ARE DYING,” “THIS IS THE END,” “I SEE ONLY BLACKNESS BEFORE ME.” – well, that’s how cold it was. 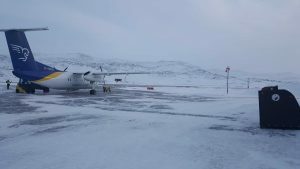 Based on what I just looked up, it was about -30.5 C (-23 F) with windchill when we landed. 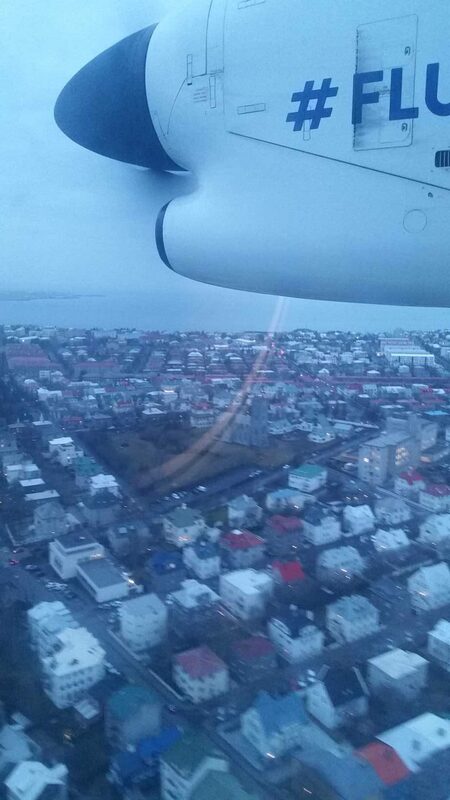 For reference, Iceland was a full 55 degrees (F) warmer when we had departed, seriously. Since the airport is obviously small you have to walk across the tarmac once you get outside the plane. Fortunately the walk over to the small terminal isn’t that far, and while it sent my Raynaud’s into overdrive instantaneously, there were at least heaters in the waiting area for us. Once we got our backpacks (which was actually really quickly) we hopped on a van waiting to take us into town. The van was probably about 20 degrees F, which doesn’t sound like much until you consider that that was 40 degrees warmer than outside. During the ride into town we got to take into the landscape without the feeling of sudden-death freezing for the first time. On the way we passed a small graveyard, which looked very picturesque with its white crosses set against the snowy eternity around it. 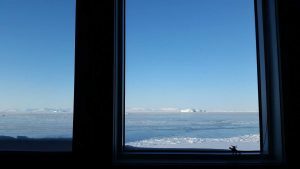 Once we got into town and got settled at our lodging (Hotel Ice Fiord – note the “i” not the “j”) Valentino practically burst out of the backpack and flew to the window. 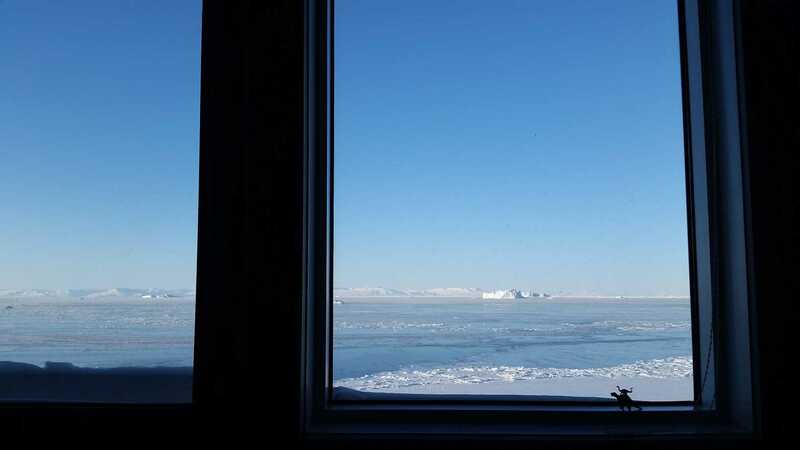 Yes our room had gorgeous views of Qeqertarsuup tunua (Disko Bay), which is itself an inlet of the larger Saknirutiak Imanga (Baffin Bay). After an orientation meeting with a local guide at our hotel we had a brief moment to relax before we had to head out into Ilulissat on foot to meet a guide who was going to take us hiking up into a UNESCO area. This is a good time to talk about Ilulissat itself. 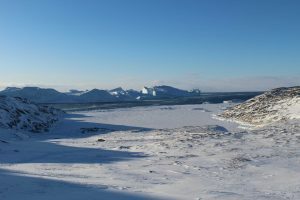 Ilulissat – formerly Jakobshavn (during Danish control) – is the municipal seat and largest town of the Avannaata municipality in Greenland. As a side note, Avannaata is the largest municipality in the world, though it only boasts a population of about 10,600. 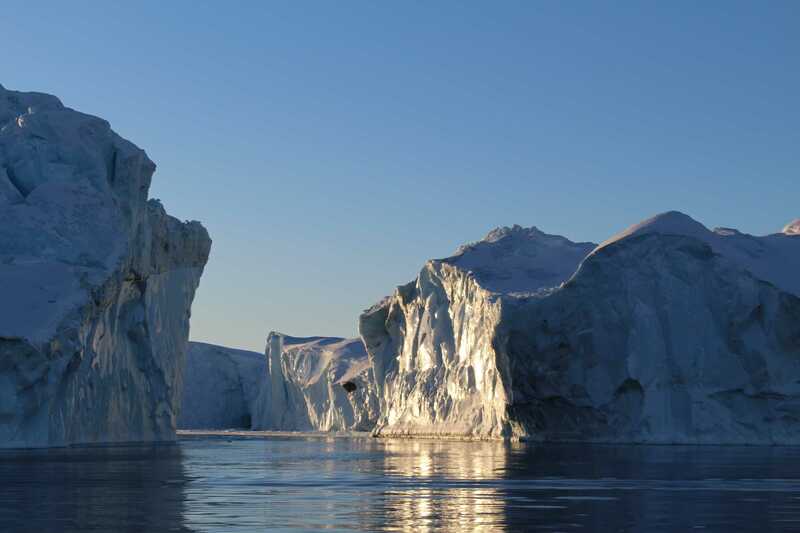 Ilulissat means “Icebergs” in Greenlandic, which makes sense considering how there are literally hundreds (thousands?) of them around the town. 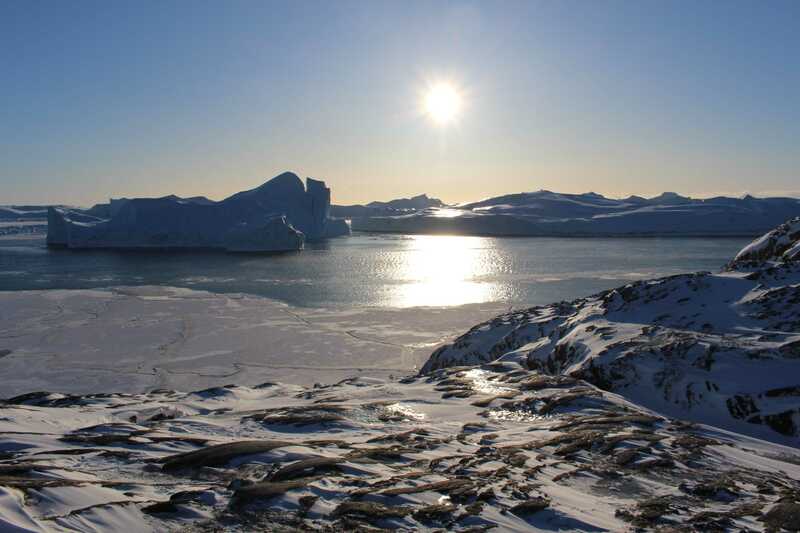 Ilulissat is located about 300 km (186 miles) north of the Arctic Circle line and has a population of about 4,800 people, which makes it the third largest town in the entire country. 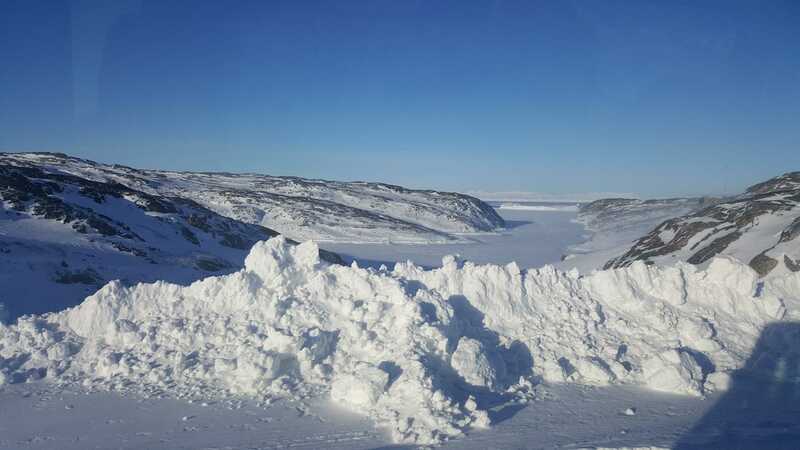 For reference the largest is the capital of Nuuk, with a population of around 17,300. 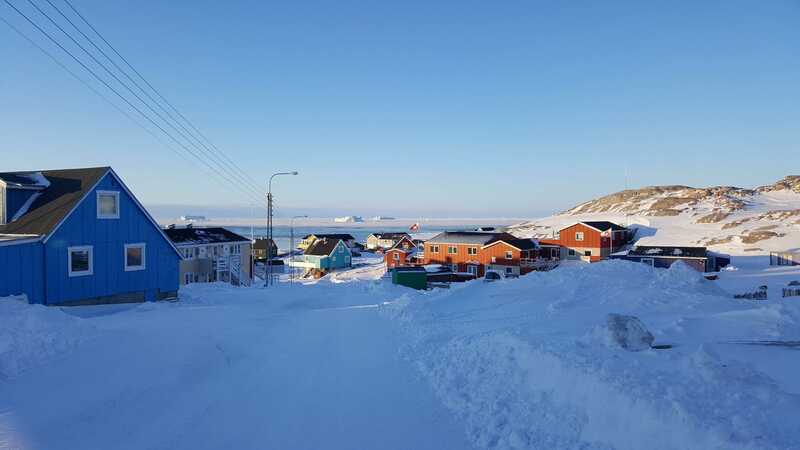 Intriguingly the 4,800 person number makes Ilulissat home to about 2,400 more people than the town I grew up in, though I can tell you outright that I enjoyed far more luxuries despite the population difference. 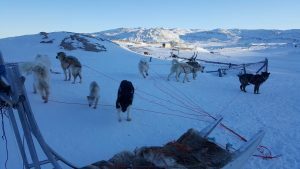 🙂 Speaking of population, Ilulissat is also home to over 1,800 sledge dogs (or, in American vernacular, sled dogs). They are all over the town, and because they can be aggressive the town map that the local guides have even has the sledge dog areas marked for you. Some of the areas are so large that they are basically little dog cities in and of themselves. 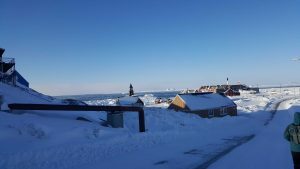 Surprisingly, Ilulissat does have taxis – though I think mostly because of tourists like us. It also has a bus system, which is to say it has a bus, singular. Also said bus doesn’t have a set route and doesn’t always run, meaning that we never even saw it, but we saw the bus shelters (which in a sad display were better than a lot of the bus waiting areas in Boston) at a few places around town. 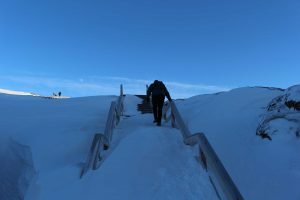 However, us being the budget-wary travelers that we are – and given Ilulissat’s relatively small area – we just walked everywhere. The only downside was that your eyes started to freeze shut – and I don’t mean that metaphorically. So, we made our way to the “downtown” area where we met up with the guide and the other travelers, and then we were off to the “old helipad” which was the only way to get to the town via air until 1983 when they built the airport. 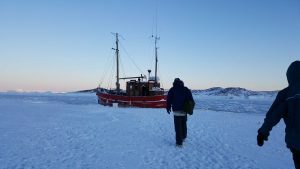 Obviously there are no roads to Ilulissat, you either come in via boat (and small boat at that due to the ice) or via air. I guess some people technically do come in via the back-country, but insofar as roads go, there are none. 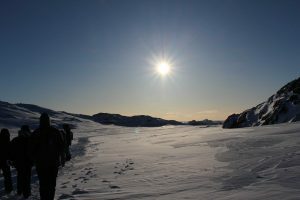 Once at the old helipad we started hiking up into the Ilulissat Icefjord (Ilulissat Kangerlua) area, which was declared a UNESCO World Heritage Site in 2004. In this next photo you can even see the little “box” markers which demarcate the boundary of the UNESCO site. Basically, the difference in dropping a water bottle on one side of that block versus the other side is very substantial if you are a litter bug. Also don’t be a litter bug, I once imperiled myself to reclaim a water bottle I’d dropped – and I don’t regret it. Once you hike up over a crest you can start to see the glacial flow in the Icefjord. As it is a UNESCO area you aren’t supposed to walk off the path, however this is a little more difficult in winter as there were only a few areas where you can even see the path. The good news is that the ice and snow protect the fragile surface, so as long as you practice a leave-no-trace policy it’s not a big deal if you suddenly realize you’re 2 feet to the left of the path, but obviously wondering way off is both bad for the surface and also likely to kill you – no really, there were “you will die” signs near several of the crags. There’s also the chance that you’ll damage some of the ruins from the Sermermiut Settlement, which are the remains of an Inuit settlement which was abandoned in 1850 when the last residents moved to Ilulissat. As a point of reference, the archeological record indicates that people had lived in this area as early as 4000 years ago (imagine how fun that was). The highlight of the hike was the vantage point at Nakkaavik or “the place where you fall.” It’s also locally known as the “Old Wives Crevice” because in earlier times the elderly women would commit suicide by throwing themselves into the crevice so that the settlement didn’t need to use their obviously limited resources to support them any longer. Fun times those. 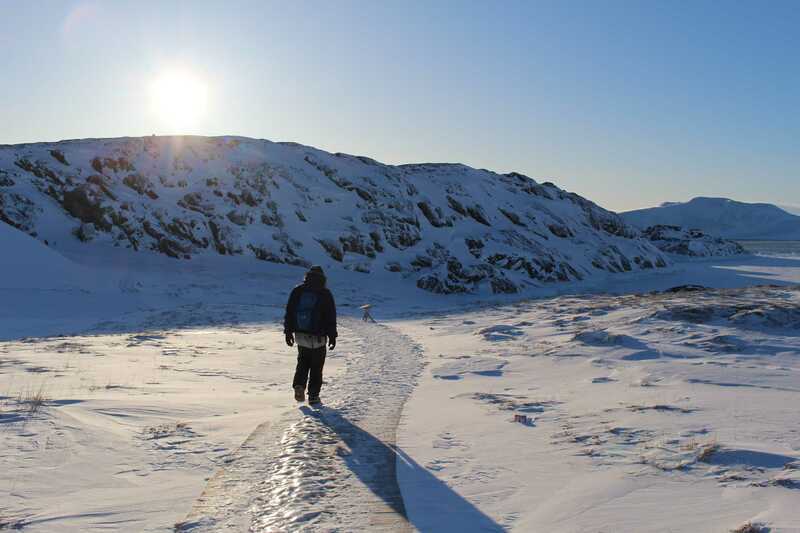 Getting up to Nakkaavik was probably the most challenging portion of the hike as it was steep and snowy. 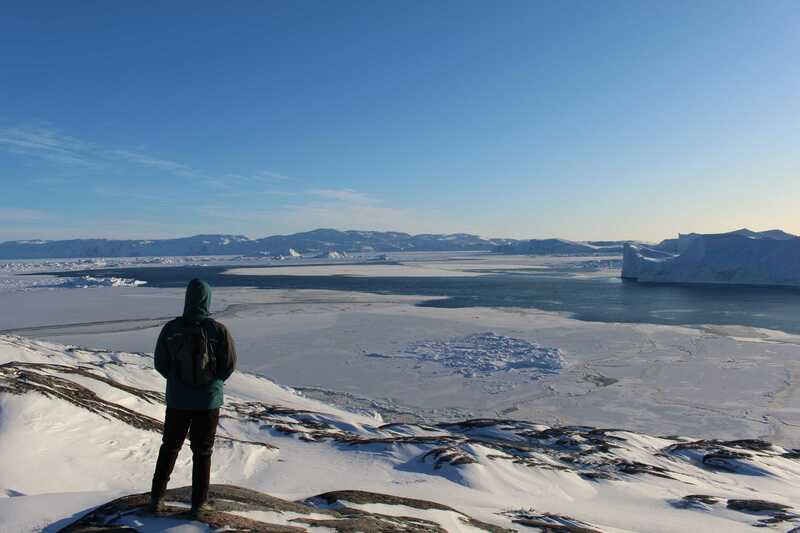 At the top though you get some awesome views of the Icefjord. 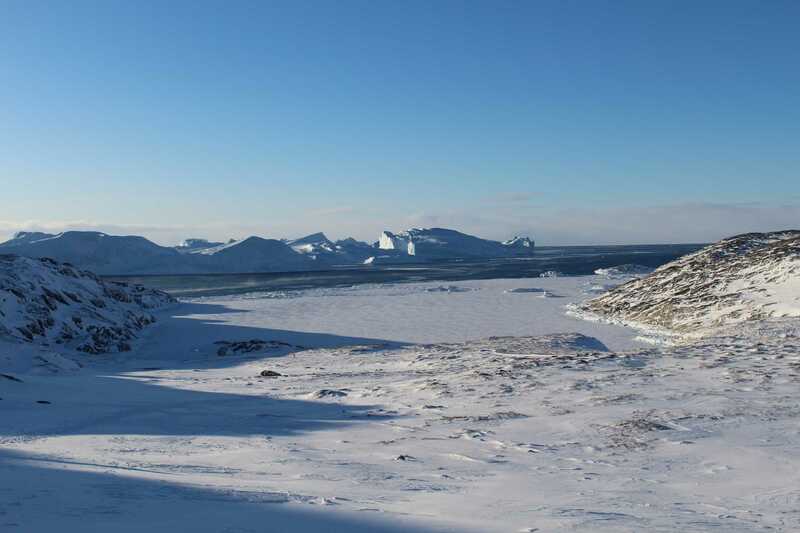 The Ilulissat Icefjord runs west 40 km (25 mi) from the Greenland ice sheet to Disko Bay just south of Ilulissat. 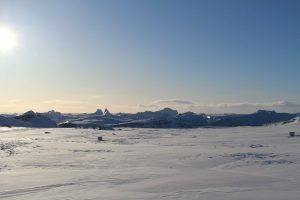 At its eastern end is the Jakobshavn Glacier (Sermeq Kujalleq) which is the the most productive glacier in the Northern Hemisphere. 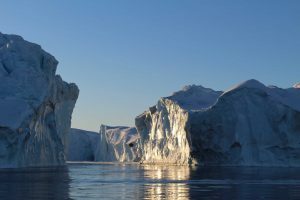 The glacier flows at a rate of 20–35 m (66–115 ft) per day, resulting in around 20 billion tons of icebergs calved off and passing out of the fjord every year. Icebergs breaking from the glacier are often so large – up to a kilometer (~3,280 ft) in height – that they are too tall to float down the fjord and lie stuck on the bottom of its shallower areas, sometimes for years, until they are broken up by the force of the glacier and icebergs further up the fjord. All the ice got a certain polar bear pretty excited – especially since he could smell other polar bears on the wind. 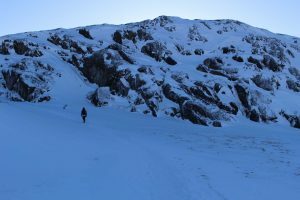 After enjoying some hot coffee that the guide had carried along in a serious thermos we started making our way back – which was good because my hands were in the first stages of frostbite. I don’t mean that lightly either, the Raynaud’s was causing my hands to start to die (I recognized this from when I had a toe almost go necrotic from Raynaud’s 4 years ago), so much so that one of my fingers was discolored for over 24 hours. This was with 3 layers of gloves on, mind you – but at less than -20 F there’s only so much you can do with Raynaud’s. 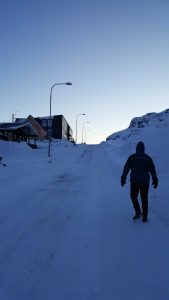 After the hike we headed over to a grocery store, Pisiffik Ilulissat, to pick up some food. Prices were very high – as you would expect – but after living in Iceland we’d been mostly blunted to such things. 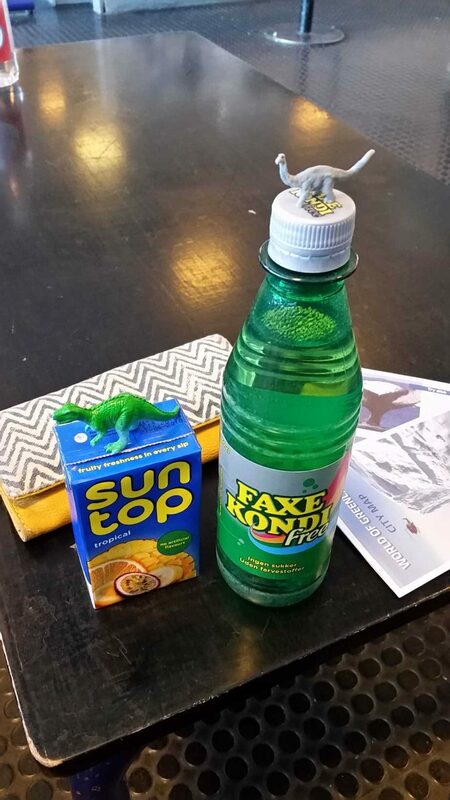 After some confusion as to whether or not we could actually pay with a U.S. credit card (English is not common) we left with some instant soup, cheese, Danish candy, and a rhubarb drink which turned out to be a concentrate (in a hugely ironic flashback to the time I made the same mistake in Copenhagen). We then made our way back to the hotel where we focused on warming ourselves up and enjoying the view. We learned that the hotel has a nightly happy hour at the bar from 5-6pm, so we took advantage of that both nights we were there. 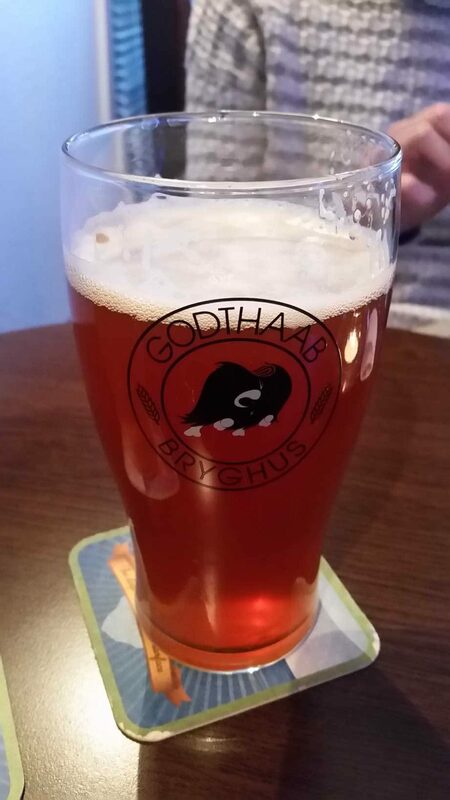 We ended up trying all 4 Greenlandic beers they had on tap, with 3 being from Brewery Immiaq in Ilulissat itself and one from Godthaab Bryghus in Nuuk. Despite the glass, this is actually the “Aasaq” juniper pilsner from Brewery Immiaq. I was wholly impressed by the beers I had, though I guess in such environments you probably get really good at making booze. After happy hour we proceeded straight to dinner. We decided to just eat at the hotel since it was so flippin’ cold out. 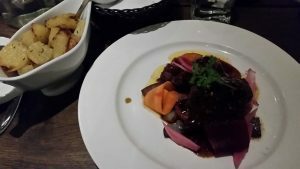 SB had the non-local fare of Pad Thai (the chef at the hotel was from Thailand), while I went with something much more unique and regional – fin whale. It’s not a great photo, but you can see how dark the meet is – with almost a “reddish” tone to it. This was my first time ever having whale and it had a “gamey” or “wild” taste to it in a similar fashion to venison. I mean it tasted nothing like venison, but that “gamey” taste is the best point of comparison I can think of. I liked it, but I am also not a picky eater. I’d most certainly try it again if given the option. 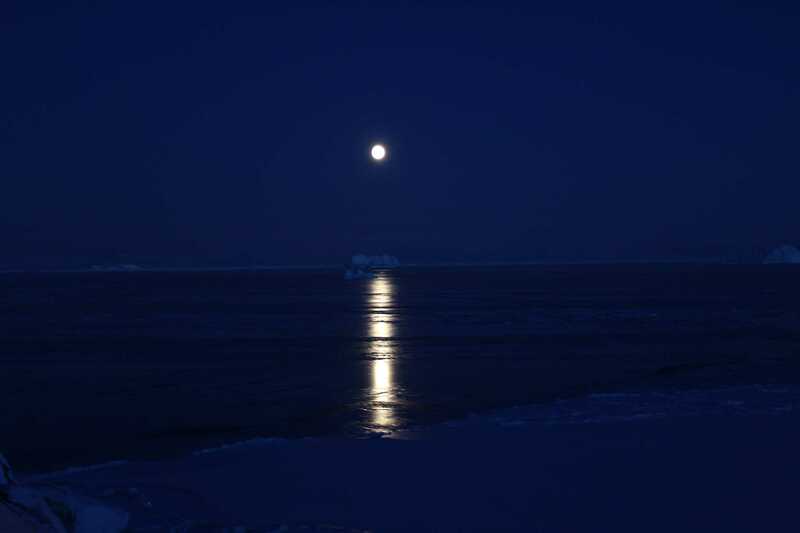 After dinner we went back up to our room for a bit and we noticed the really gorgeous moon out over the sea ice. That evening we had a northern lights tour. Due to some delay that was never explained our guide ended up being 30 minutes late but it wasn’t that big of deal. As usual we got no photos of the lights (hey – it was F*CKING COLD – somewhere below -30F at that point 😛 ) but we did see them! And wow, they were HUGE! While not as intense as SB and I have seen them, this was by far the largest we’d ever seen them. When I say “the whole sky,” I mean it. If it wasn’t for the fact that the moon was just 2 days away from being full it probably would have been a crazy display, but the super bright moon kind of dimmed them a bit. The way the tour was set up was that you could leave whenever the van showed up. The viewing spot was on a hill just above town (Ilulissat unsurprisingly doesn’t really produce much light pollution) so it wasn’t a long trip. We honestly didn’t stay nearly as long as I would have liked – which is mostly on me. The lights were so large that it was just a matter of time until they really flared up (and they started to a few times) but I was just so damn cold that I couldn’t take it for long. SB had retreated to one of the vans, but it wasn’t running so it was maybe -10F as opposed to -30F. So when the other van got back we hopped on board and headed back to the hotel. While I would’ve liked to enjoy the huge display longer, with Raynaud’s such extreme cold becomes a health hazard more quickly than it normally would, plus -30 is still freakin’ -30 no matter who you are. 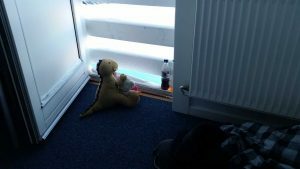 That night we turned up the radiators and snuggled beneath our covers – and comically made it too warm in the hotel room, so between that and some very loud hotel neighbors (that or really thin interior walls) I really didn’t sleep well the first night. 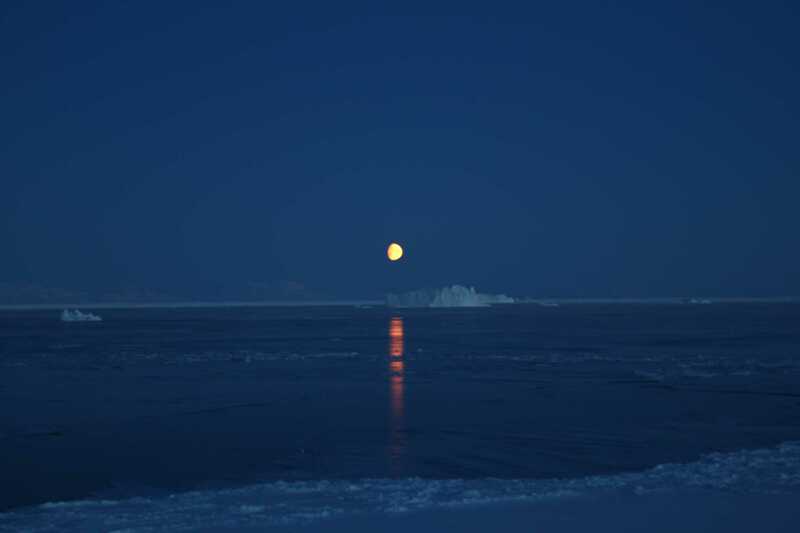 However, the next morning the moon was still looking amazingly pretty out over the bay, so that was really nice! 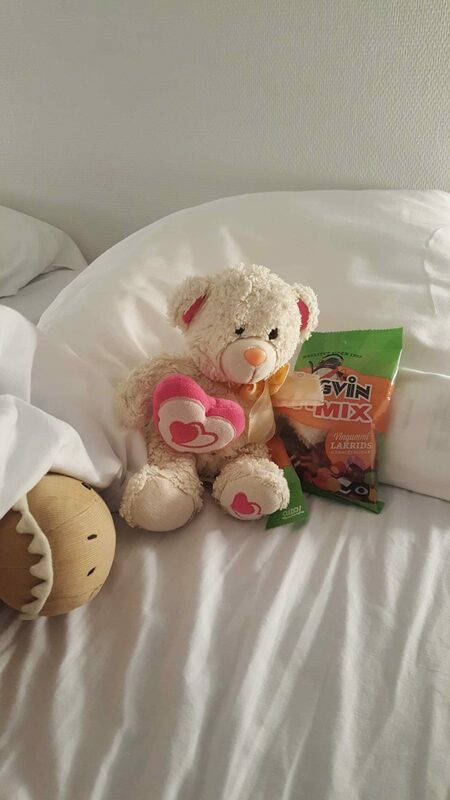 We ate breakfast at the hotel (quite yummy) and Valentino might have snuck in some Danish penguin candy as well. Then we were off into town again for some dog sledging (or again, as I’ve always known it “sledding”)! This was probably the one thing we were most excited about four our entire trip – because how often do you get to go dog sledging in the Arctic Circle during winter!? While we had to walk into town, from there we were carted up to the edge of town near one of the sledge dog “cities” where we got decked out in some extreme arctic gear consisting of the heaviest boots I’ve ever worn as well as an entire seal-skin outfit. 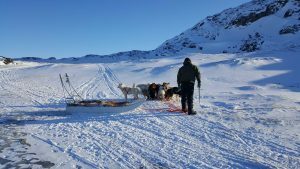 From there we trudged out to meet the musher for our team of dogs. We quickly learned that he spoke no (or at least very, very little English) but it’s amazing how much you can communicate with gestures, so that wasn’t a problem and he was super nice anyways. 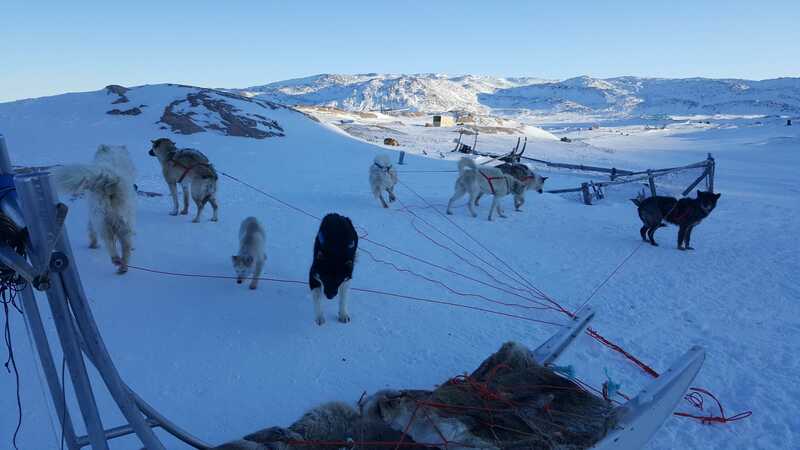 One thing I learned that you don’t really think about is that these sledge dogs are much closer to wolves than are the dogs I (and presumably you) grew up around. They are true-and-true “work” dogs with established pack hierarchies (that the musher must stay on top of in order to maintain control) and behaviors. As such, you’re not really supposed to interact with the dogs unless the musher points out a specific dog that you can safely interact with. 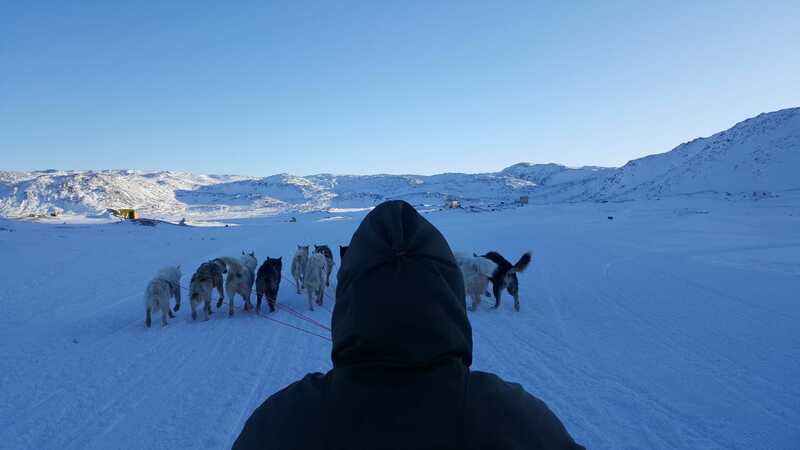 In fact right as we were approaching the sledge a fight broke out between some of the dogs which the musher – as the de facto alpha dog – had to break up. They were still dogs though, and as such were very curious and inquisitive, as well as playful – at least when they weren’t fighting with each other, which seemed pretty constant as they strove to maintain the hierarchy. 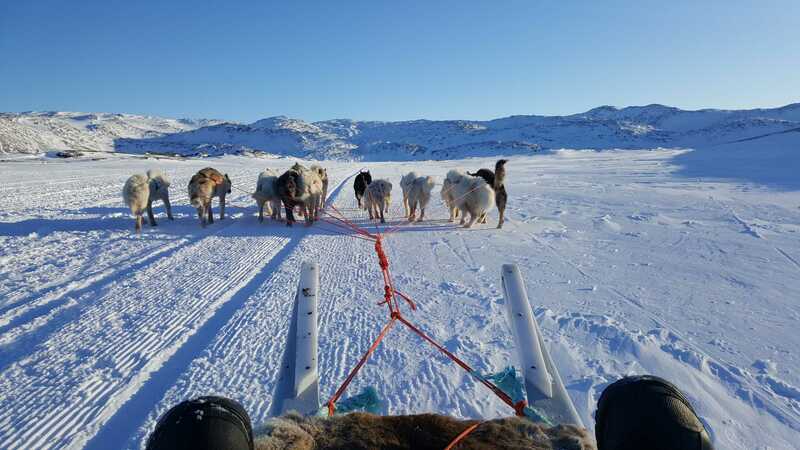 The sledge fits 3 people (in our case 2 people plus the musher – though he was quite adept at getting on and off of it while it was moving, even at high speeds), and I set in the back with SB in the middle between my legs. The way you all fit on the sledge is kind of uncomfortable and really works the ole’ hip-flexors, but it’s most definitely better than walking across the snow and ice yourself. When we first took off I felt like a little kid, it was so freaking exciting. 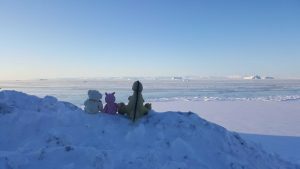 It was obviously really cold, but the seal-skin outfits helped a lot, though the icy wind was still pretty savage, and even our Greenlandic musher was getting blasted pretty bad by it (which he jokingly pointed out to us). We made our way up and around town, out into the back country, then skirted the airport before heading up to a nice overlook area to give the dogs a break. Once we stopped two of the dogs from another team started having dibbities, which Tristen thought was extraordinarily manlies and which the mushers though was quite funny (as did I). I figured all that hard work had made the dogs ready for some horizontal tango. Aside from dog dibbities, the overlook area had a fantastic view of the bay and one of the mushers busted out some warm coffee that really hit the spot. After that we made our way back into town which was again timely as my hands were starting to eat it as we’d been in the cold for about 2.5 hours at that point. 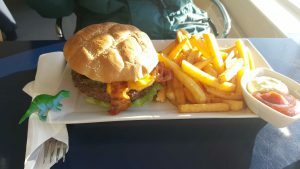 Speaking of eating 🙂 – once back in town we headed to Cafe Iluliaq for lunch – and what I lunch we had! SB went with some delicious salmon and shrimp, while I – once again – went with a “first time” food of Muskox. Yes, Greenland has its fair share of umingmak, and while they don’t live where we were I didn’t skip the chance to try a muskox burger despite it being the most expensive thing on the menu (again, Iceland has numbed me to food prices that may have formerly gave me PTSD). The verdict? It was delicious. Whereas I struggle to find a parallel with whale, muskox tasted a lot like bison if you’ve had that (or as we like to incorrectly call them in Murka’ – buffalo). In fact if presented with muskox and bison side-by-side I probably wouldn’t be able to tell the difference as I’ve not had either of them enough to develop a full-fledged knowledge of their nuances. Oh, and if it wasn’t obvious, Pigsten was also a big fan. Speaking of Broli, this was his first adventure with us! 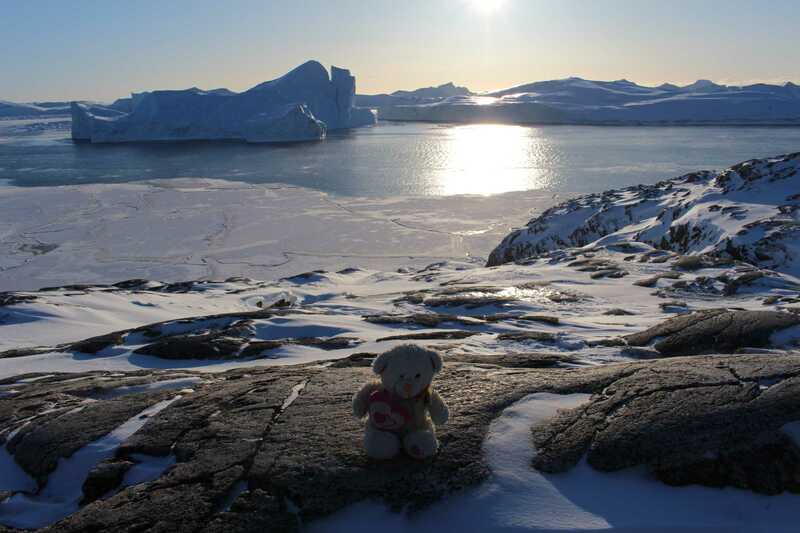 Little guy is still brand new to the world and he’s already been to the Arctic Circle! We used our down time at the hotel to just relax. We planned on eating in that night with leftovers from the night before and snacks as a way of saving money, and since we had no further tours for the day it was mostly just family chill time as we waited on happy hour. The Boys kept themselves busy by drinking our rhubarb drink and opening and closing the door as a joke (it’s not an exaggeration that merely opening the door for a few seconds could drop the room temperature by a solid 10° F almost instantly). As you can see we used the door as a rapid-cooler for our drinks! Our door didn’t lead to anything, it was supposedly a “balcony” though as the above photo shows it was really just an open doorway with boards over it to keep you from plummeting into the ice. I’m not complaining, our views were fantastic – but it was kind of funny to us. 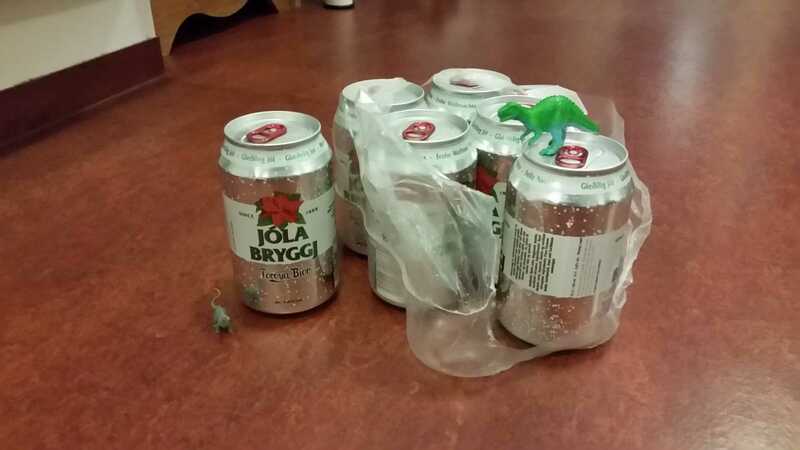 Made a great cooler though – but you had to be careful lest it freeze something solid in like 10 minutes. Speaking of freezing solid, Valentino was of course very comfortable – and was mostly gone visiting other polar bears. Pig did ok with his winter fur coat, but still needed his winter gear. Tristen, Pigsten, and Broli had to have serious warming equipment though (however Tristen will deny this) as dinosaurs weren’t cut out for such environments. That didn’t stop them from making brief forays out into the frosty landscape though. Since we had no further plans for the day, we had originally planned to just partake of happy hour and then rest for the evening then sleep in the next (final) day. 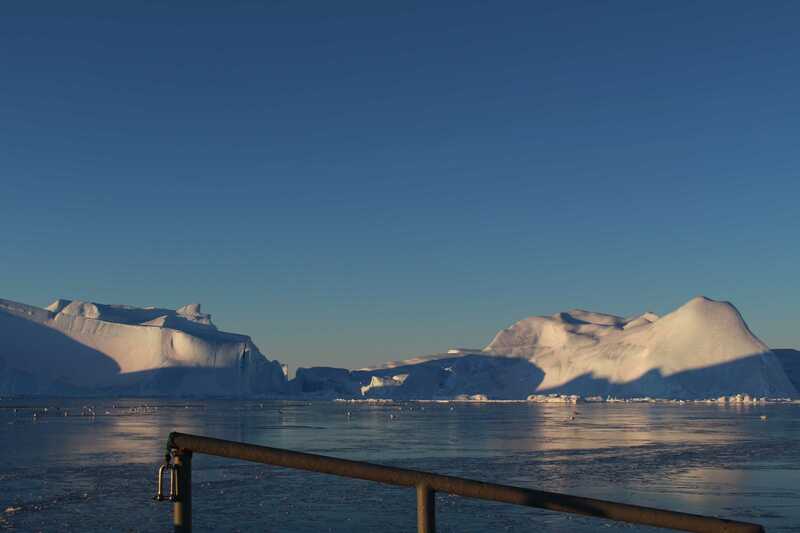 However, we were very fortunate in that our previously cancelled boat tour (due to the flight cancellation and one day delay) was rescheduled for our final morning. The good news is we got to have the experience! The bad news was the earliest morning thus far, but that’s hardly bad in comparison to the experience. That whole rescheduling bit was somewhat frustrating, as no one told us it had been rescheduled and we had to figure it out on our own. However, had we not done so someone at the hotel was awesome enough to leave a little sign on our door letting us know we had a new tour, but that wasn’t until the afternoon of the day before. Either way, not a big deal, just not a lot of communication (which was sort of a constant thing, but that’s something we’ve grown used to). As we had to get up early, I used the lesson of the night before to sleep with my earplugs (which I’ve grown used to doing now that I live with lovely undergrads) and slept much better. 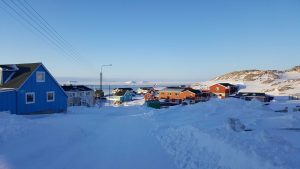 The next morning we were up for the start of breakfast then back out onto the streets of Ilulissat. 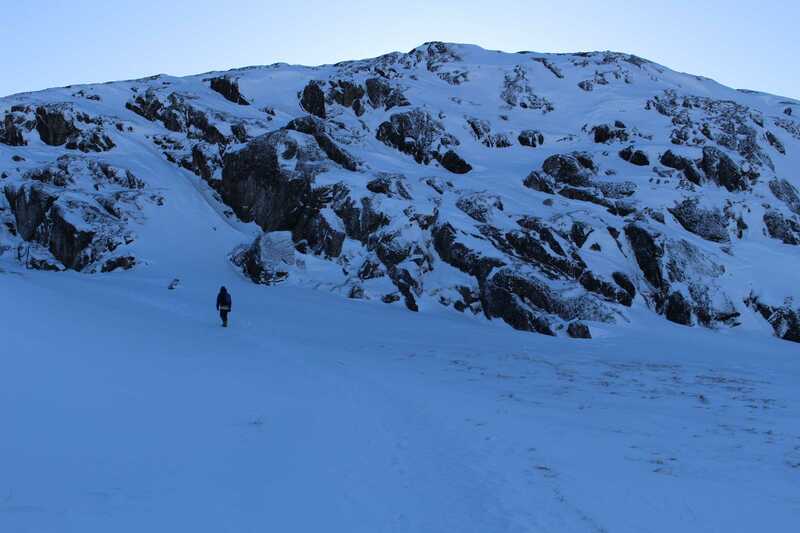 The walk into town wasn’t bad expect for one hill, was was pretty substantial with the icy snow. 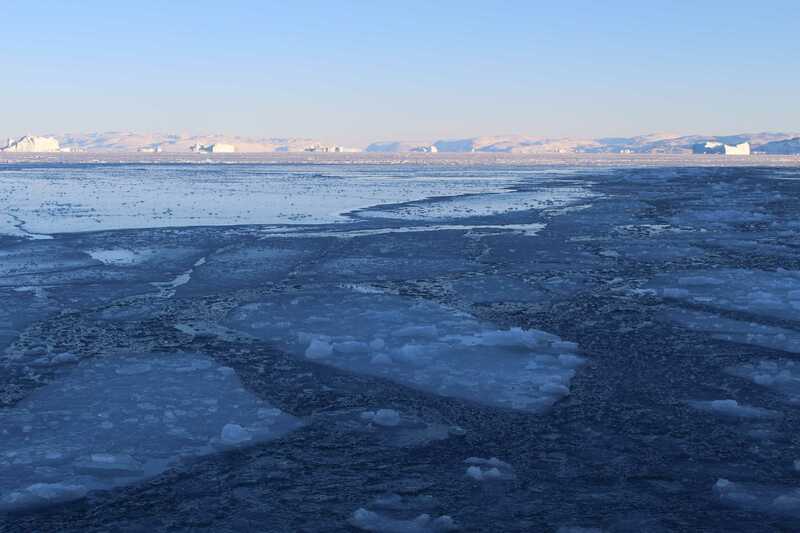 Once “downtown” we met our guide and headed down to the harbor, which is to say we headed down to the ice sheet. 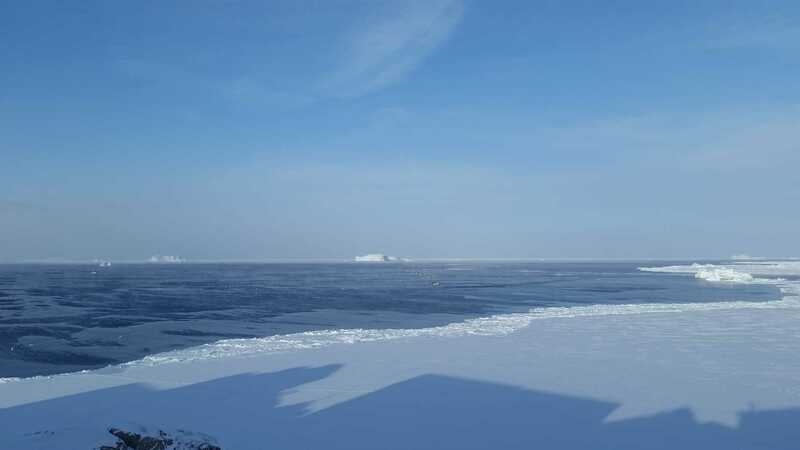 The harbor itself freezes solid in the winter, so the smaller boats just “dock” at the edge of the ice. It was pretty neat getting to walk way out onto the ice shelf to our boat, we even passed a couple of dead and frozen solid seagulls – it kind of looked like some morbid abstract art piece due to the way they were all contorted. 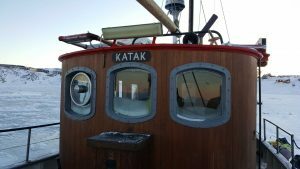 Our vessel was the “Katak” – a name which I didn’t get to learn the origin of as our Captain spoke no (or again, very little) English. What was really awesome is that since our tour had originally been cancelled when no planes could fly in, there were only 4 people on the tour (5 if you count our guide, 6 if you count the Captain too). 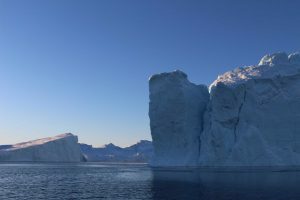 So that was awesome as the boat tours are the most popular tour in Ilulissat during the winter from what I’ve been told and thus can be “crowded” (again relative). 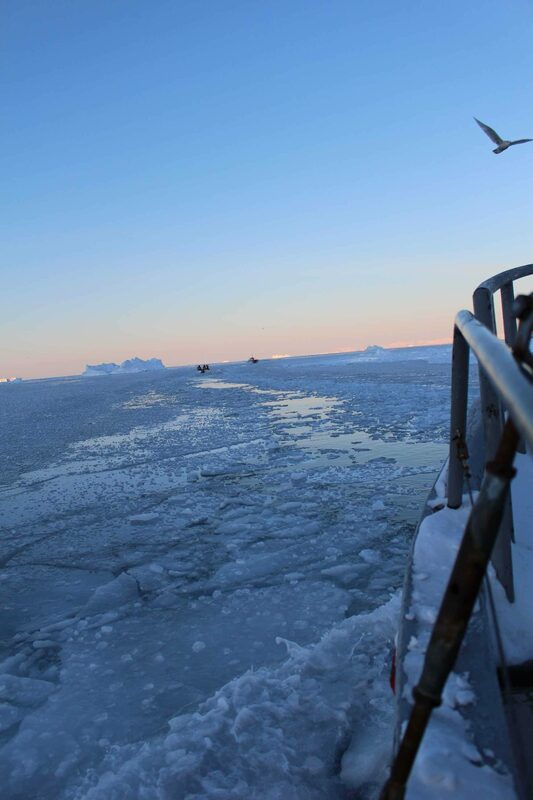 Since we were one of the first boats out that morning our job was – in part – to help break up the ice that had formed in the “channel” overnight. Heck, when we first got started Katak herself was frozen to the ice sheet and it took a bit for us to detach. 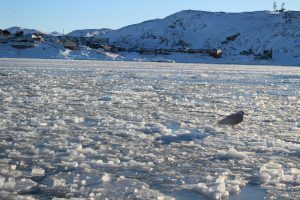 During the winter months the fishermen keep a “channel” in the ice clear, which they use to get in and out. 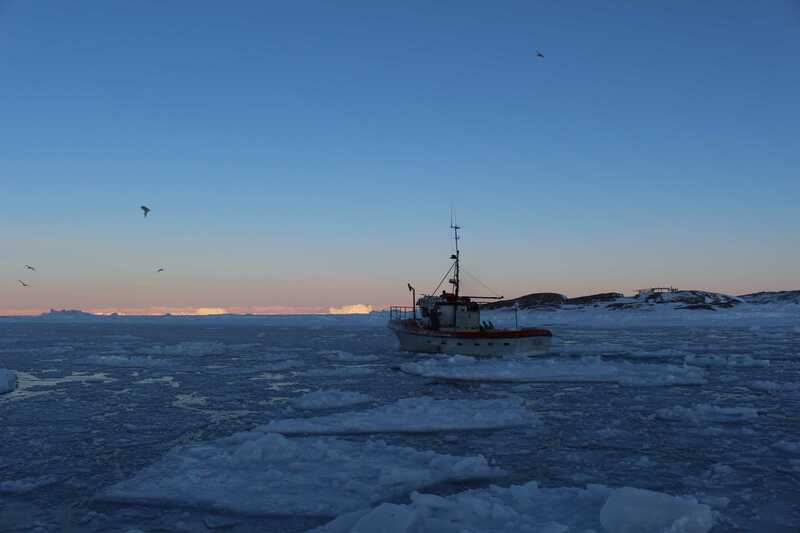 Overnight on cold nights it refreezes, but generally not enough to keep boats from busting through again. Thus the first boats on cold nights generally have to serve as de facto ice breakers, a job which partially fell to the Katak on that morning! 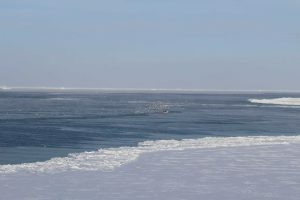 I’d never been on a boat which was breaking ice before, and it was an interesting experience. 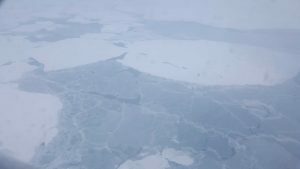 The way it worked was that we literally sailed up onto the ice, then smashed down through it – this then repeats over and over as you slowly progress forward. 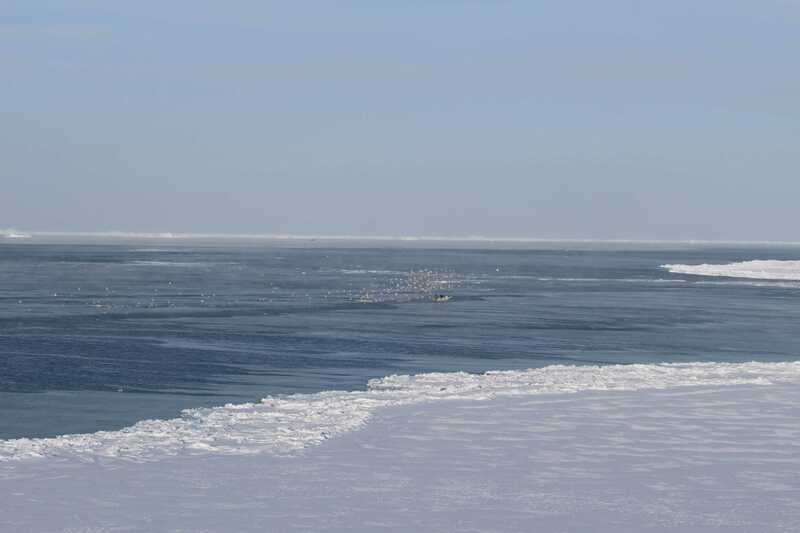 Though pretty much the entire bay was ice of varying thickness, there were a few spots of “open” water as well. 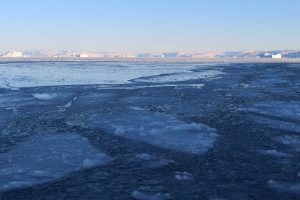 We made our way out to the mouth of the Icefjord which was simply breathtaking. Fortunately the interior of Katak was open to us (including the hold) and our guide had even brought hot tea and coffee to share. 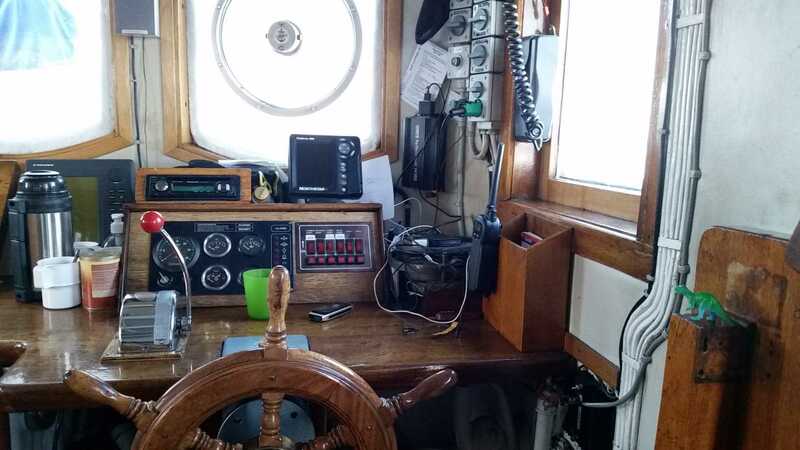 Romping around in and on the Katak made me have major flashbacks to the time I went sailing off the coast of Denmark – on a boat very similar to Katak! Pigsten also spent a fair amount of time exploring the ship. And he really filled his oats as the “Dinosaur Captain” of Katak. Despite the cold we didn’t spend too much time inside as the views were just too incredible to view through frosty windows. 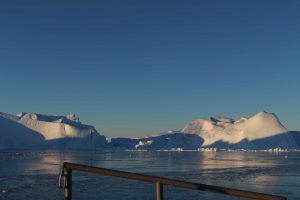 We saw so many icebergs, including a few that looked like they were going to calve in a major way at some point in the future. One nice thing about our tour is that since it was a special charter for the few people (read: 4) that were still around from the cancelled tour, it was also a few hours earlier than the normal tour – which is normally done once the ice has been more busted up by other boats. The result was that we got to watch the sunrise over a glacier, an ice cap, and icebergs. Certainly a moment for the ole’ “things I’ve experienced” list! A few areas around the icebergs were pretty slow going for the Katak as the ice was quite thick. We even got “stuck” once and had to change course, but the Captain obviously knew what he was doing as it was a non-issue. 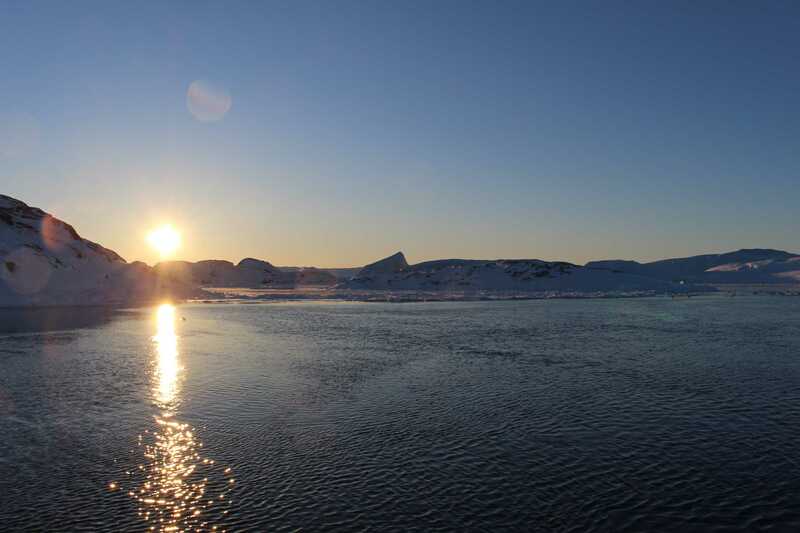 After about two hours out in the bay we made our way back to Ilulissat. 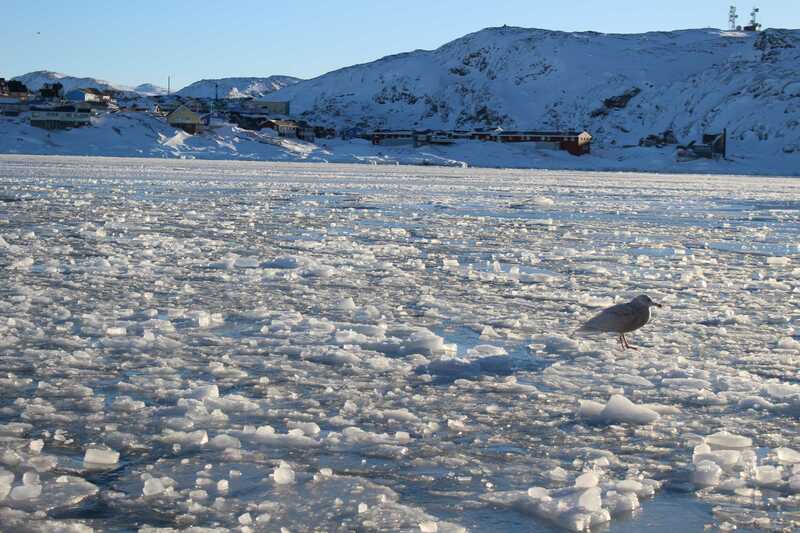 SB captured this cool photo of a very cold looking seagull on the ice in front of town. Once back in town we grabbed our stuff from the lobby of the hotel and hopped on a van back out to the airport – alas, our short adventure was nearing its end. At the airport we went through the extremely simple check-in process and then shared a sandwich and drinks from the small cafe – including a Soda called “Faxe Kondi” that I’d been wanting to try (it was basically 7-Up). After a bit our plane showed up, and it was Thurid again! This must be her route. We then proceeded through what was probably the easiest airport security checkpoint I’ve been through in my life before heading out to Thurid. We got settled into our seats and before long the engines were revving up and we were on our way! 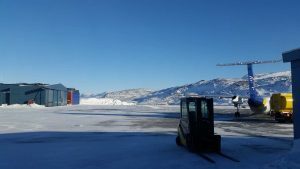 As mentioned, Thurid is a Bombadier Dash-200Q and one of their major selling points is that they don’t need very much time to take off – and since Ilulissat’s runway is unsurprisingly not that large, Thurd is a star performer. In fact I think she got airborne faster than any commercial plane I’ve ever been on in my life, including the island hopper in the Bahamas (which had a sand runway). 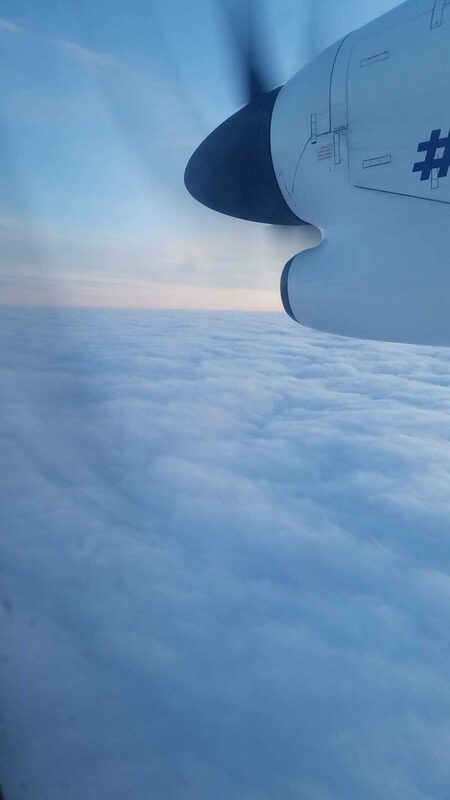 Once in the air we got some good views of the countryside, which was easier on the way out since the clouds were gone. 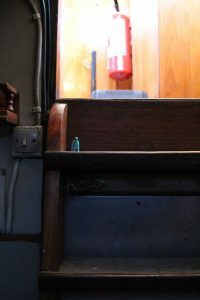 SB and I generally switch off on the window seat, and since she had been on the window on the way in, it was my turn to be on the window on the way out. This allowed me to study the transition of the landscape a little better. Namely, I got to watch the icy – yet rocky and mountainous – coast transition into the Greenlandic Ice Cap (Sermersuaq). This next photo showcases the transition really well I think. 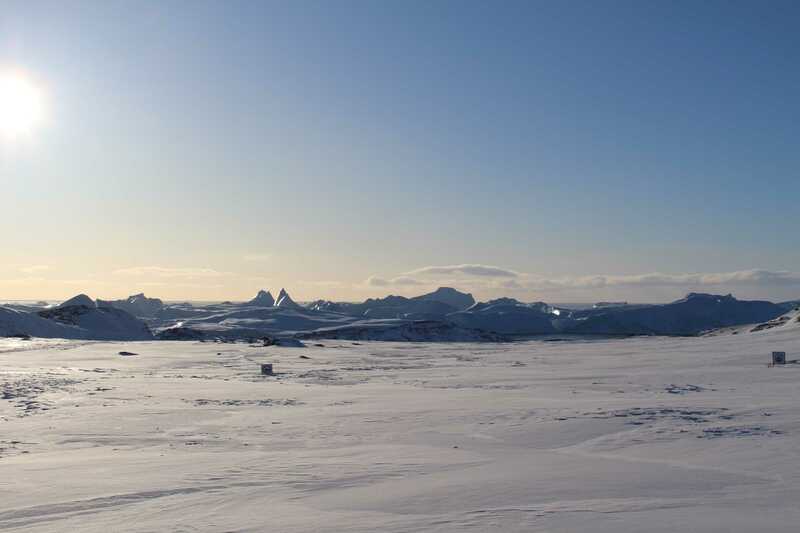 On the right you can see the “coastal” landscape, whereas the left is the start of the massive ice sheet. 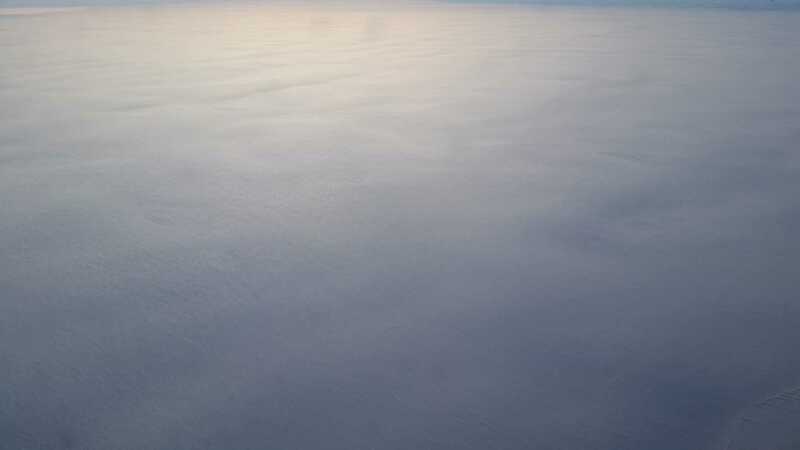 Once we progressed more inland the ice sheet went on full display, which is to say that it looked like an infinite expanse of ice – and honestly you’d struggle to tell it apart from clouds if you didn’t know what you were looking at. 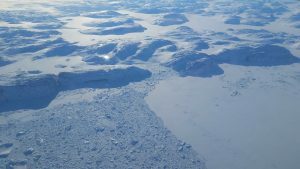 So just what is the Greenlandic Ice Cap (or ice sheet)? I’m sure you’ve heard about it in the news as it relates to climate change, but seeing it for the first time in person really blew my mind as to its scale and beauty. 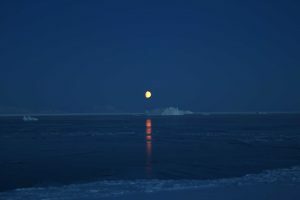 Well, for starters its the second largest body of ice in the world – surpassed only by the Antarctic ice sheet – and comes it at a STAGGERING 1,710,000 sq km (660,000 sq mi) which is around 80% of the surface of Greenland. It’s nearly 2,400 km (1,500 mi) long and 1,100 km (680 mi) wide at its broadest. 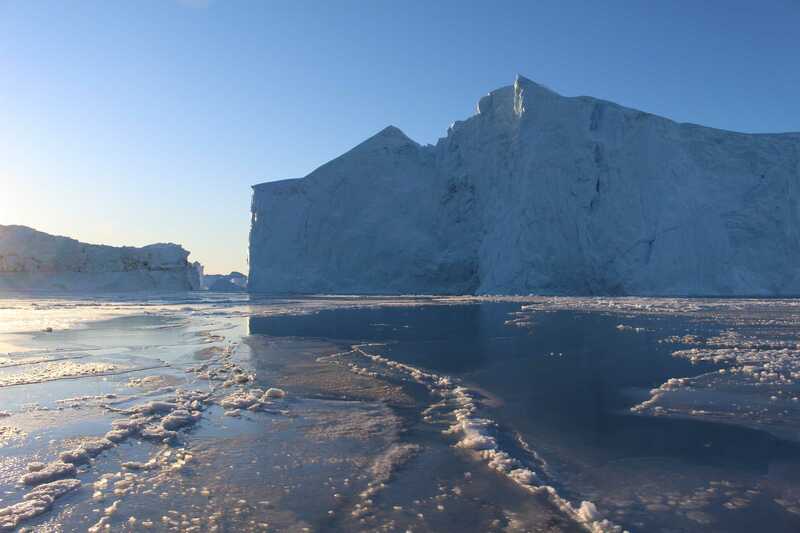 The ice is mostly over 2 km (1.2 mi) thick, but can reach over over 3 km (1.9 mi) at its thickest! It also averages about 2,135 m (7,005 ft) above sea level. Keep in mind, that’s solid freaking ice we are talking about! 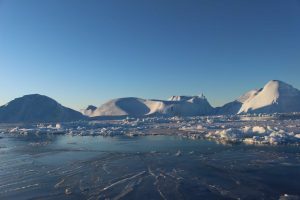 Not only that, but in addition to the core ice cap, there is an additional 76,000 – 100,000 sq km (29,000 – 39,000 sq mi) mass of ice – in the form of glaciers and smaller ice gaps – all around the edge of the larger ice cap. This stuff is absolutely incredible to me. The sheer scale, especially when you see it yourself, is awe inspiring. Of course it’s also melting. As an Ilulissat based point of reference, in 2015 the Jakobshavn Glacier (Sermeq Kujalleq – the one we hiked to an overview of) calved an iceberg that was about 4,600 feet (1,400 m) thick with an area of about 13 sq km (5 sq mi). While that sounds cool, it’s actually not, literally and figuratively. However, I shan’t dive into a lecture about climate change here, I just share all the above information to give you a frame of reference as to just what people are talking about when they mention the Greenland Ice Cap. 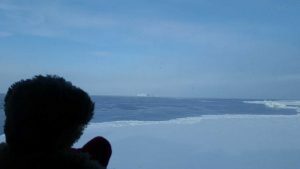 As we proceeded eastward across the ice cap clouds started to move in, so I settled into a good book. Eventually a few ominous looking mountains began to poke through the clouds, which suggested we were nearing the coast. From there were proceeded out over the ocean which was pretty much entirely in cloud cover for the rest of the flight. 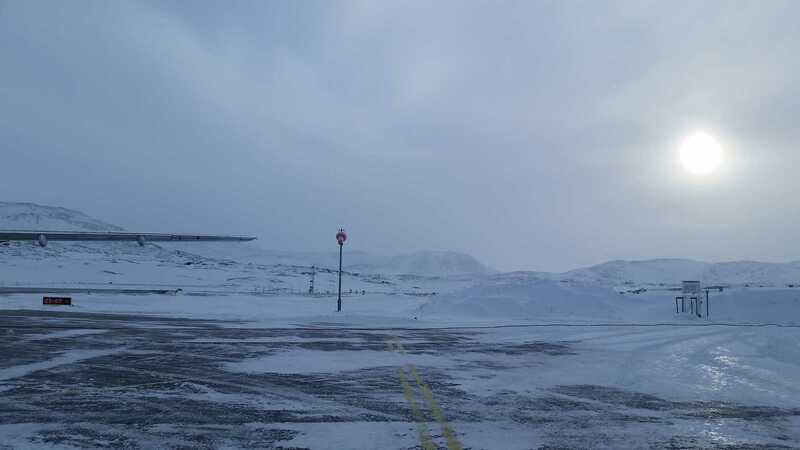 Once we got back to Iceland, oh lovely ole’ grey Iceland, the sun just gave up and vanished entirely. 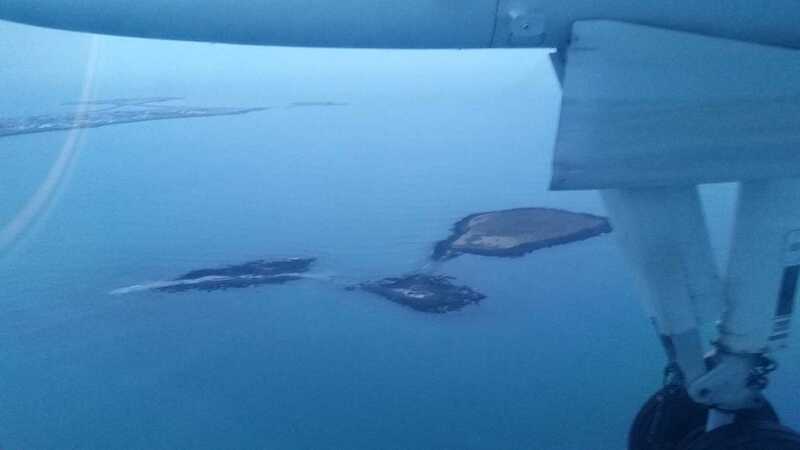 However on the approach to Reykjavík we did get to see Akurey – the “Puffin Island” we had visited back when we first moved here! We also got some nice – if not dreary – views of the peninsula and city itself. We had a nice smooth landing and then it was time to part ways with Thurid, our arctic adventure plane! Once inside the airport we stopped through the small duty-free store to pick up some more Brennivín, a six pack of beer, and some wine (seriously the airports are the best place to buy booze in Iceland). 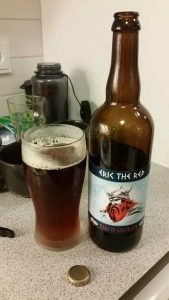 There was one lone six pack of Christmas Beer left and after making sure it was still good I went with it as a way of being festive! In the beer realm, back when Meem had visited we’d also picked up a bottle of “Erik the Red” from Godthaab Bryghus at Vínbúðin with the goal of saving it until after the Greenland trip. 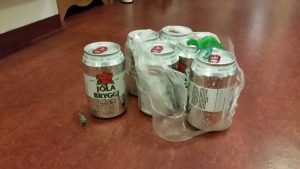 For me saving a beer for so long was a lofty mission – but I did it! Heck I even waited 4 days until the Saturday after we got back to open it! It was yummy, and a nice celebratory reflection on the adventure we’d had. 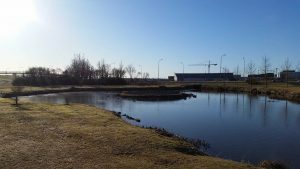 Chuck and Chica’s home pond in Tjörnin – they are actually in this picture if you can spot them! And that, dear friends, was our trip back the Arctic Circle, or as we call it, the Greenland Adventure. I always like writing these posts after the fact. Not only do they serve as a really good e-journal that I can revisit in the future, they also remind me of just how fortunate I am. Obviously experiencing something is the most profound, but I’ve also found that writing about something adds an additional layer of appreciation that simply looking back at photos doesn’t deliver. 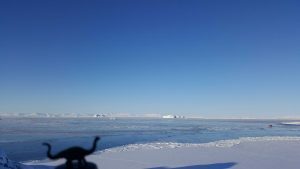 In that way this blog has always been more about my future self than any external audience, and considering that I’ve now been to the arctic circle twice – and done so with that pesky fiend Raynaud’s – Dinosaur Bear has proved to be a valuable tool of introspection. All content on this blog is © unless otherwise noted. Any reliance on the information presented herein is at your sole discretion and liability.